THE SYDNEY Swans are angered by an AFL edict to scrap the club's controversial cost of living allowance (COLA) after being informed it was gone at Tuesday's Annual General Meeting. However, an allowance is likely to be granted to Swans players who earn below a certain income with that figure yet to be determined. 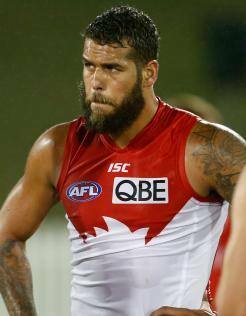 The decision was not unexpected, with clubs remaining outraged that the Swans could lure high-priced recruits Lance Franklin and Kurt Tippett in successive years and also pay them a cost of living allowance. But the Swans argue that the cost of living in Sydney remains higher than other states and they were able to afford Franklin and Tippett because of smart use of the veterans' allowance, the retirement of former stars and the offloading of other players. Swans' CEO Andrew Ireland and chairman Andrew Pridham said in a statement that the club was disappointed with rival clubs' ongoing campaign to remove the allowance. "The club has used the allowance for its intended purpose – to provide all players on our list compensation for the higher costs associated with living in Sydney. Our club believes that COLA is an integral part of equalisation in competition," the statement said. Greater Western Sydney is expected to retain an expansion allowance to ensure it is able to attract and retain players in Sydney. The decision was the one piece of detail to emerge from the meeting held at Mt Lofty House in the Adelaide Hills on Tuesday afternoon. The AFL released a set of agreed principles, which included the notion that all clubs need to have the capacity to pay 100 per cent of total player payments and their additional service agreements (ASA). Melbourne is one of several clubs who are unable to pay its players 100 percent of the total player payments. The AFL also plans to beef up the revenue sharing system to include both central and club specific revenue and intends to control the growth in non-player football department expenditure. Previous revenue sharing measures had an inflationary effect on all clubs lifting non-player wages and increasing the cost base of the competition. Changes are likely to the draft to remove any inequities. The veterans' allowance – despite resistance from the AFL Players' Association – was one measure being targeted. A commitment to increasing total player payments was also made as long as it was affordable for the industry while structural inequities relating to stadium deals, fixture imbalances and historical supporter base size would also be examined. The AFL has also promised to provide more central support and enforce stronger penalties for non-compliance. Collingwood president Eddie McGuire has made it clear he had no stomach for equalisation if what he described as 'cheating' continued. In the AFL statement, AFL chairman Mike Fitzpatrick reinforced the League's desire to oversee a competition where uncertainty of outcome was a feature.